In word and deed, most Americans would like the ability to be anonymous and untracked online at least every once in a while. A clear majority—59%—say that people should have the ability to use the internet completely anonymously. 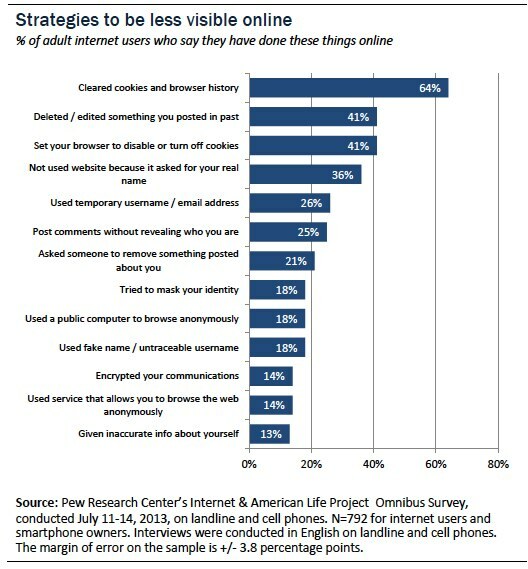 When internet users are directly asked, 18% say they use the internet in a way that hides or masks their identity. Yet when a broader battery of activities about masking behavior or content is asked of respondents, 81% say they do at least one of these obscuring activities. All told, 86% of internet users have tried to be anonymous online and taken at least one step to try to mask their behavior or avoid being tracked. The most common strategy was to clear cookies and browser history. Yet, notable numbers have taken even more sophisticated steps, such as encrypting their email (done by 14% of internet users) or used virtual personal network or proxy server, like Tor software1, that does not allow firms to track their online movements (also done by 14% of internet users). The question of whether people should be allowed to use the internet anonymously was asked of all adults (not just internet users) and 34% of the general public (including 33% of internet users) said they did not believe people should be allowed to use the internet anonymously. There are noteworthy demographic and political differences in the answers to this question. Those most likely to say that people should have the ability to go online anonymously include: men, those under the age of 65, those who live in urban areas, and liberal Democrats. In addition, those who are employed are more likely than non-workers to believe internet use should be allowed to be anonymous. Across the board, technology users were more likely than non-users to say this: that includes internet users v. non-users, cell users v. non-users, and social media users v. non-users. In this survey, 81% of adults are internet users; 90% of adults are cell phone owners; and 53% of adults are smartphone owners. The internet users and smartphone owners were asked a battery of questions about the strategies online Americans might use to hide their identity or otherwise mask them from others who might want to observe their online behavior. In all, 81% of internet users or smartphone owners said they had employed at least one of the eleven strategies we queried. Many had employed multiple strategies. The average anonymity seeker had used between 3 and 4 of these strategies at one time or another. The most consistent differences in masking strategies are tied to age. 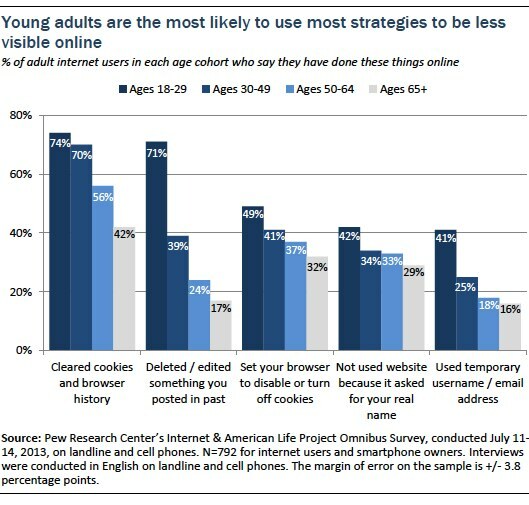 The youngest adults (those ages 18-29) are more likely than their elders to take steps to be hidden online, as the chart below shows. The one activity where the differences did not show up in a stark way involved encrypting email. Internet users of all ages under 65 were equally likely to have done that. Other notable differences relate to educational attainment. Those who have a college or graduate education are more likely than those who have not gone to college to have cleared their cookie and browser history, disabled cookies, decided not to use a website because it had asked for their name, encrypted their email, and used a proxy server or VPN. 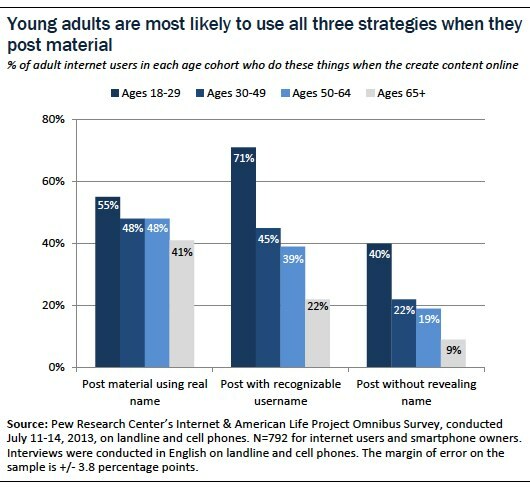 The most consistent pattern in these findings is that younger adults who use the internet tend to do all three things at greater rates than those who are 30 or older—use their real names; use a recognizable screenname, and post without disclosing who they are. This undoubtedly relates to the fact that younger users tend to be more frequent users of the internet and share more content than older users. Beyond the differences tied to age, online women are more likely than online men to say they have used their real name when they post material (55% vs. 43%). Even though many wish to be anonymous and have taken steps to obscure their online activities at least occasionally, they do not necessarily think it is possible to be completely anonymous online. All of the adults in our sample were asked: Considering everything you know and have heard about the internet, do you think it is possible for someone to use the internet completely anonymously – so that none of their online activities can be easily traced back to them? Just 37% of them said they thought it was possible to be completely anonymous and 59% said it was not possible. And internet users held exactly the same views. The most striking differences on this question were between men and women. While majorities in both genders do not think it is possible to be completely anonymous online, women were more likely than men to say it is not possible to be completely anonymous online (64% vs. 54%). We also asked a specific question about anonymous posting online. Internet users were asked: Suppose you said something critical about a product online, and you didn’t use your real name. How easy do you think it would be for the company to find out who you are anyway? Most thought it would not be terribly hard for the company to track them down. 42% said would be “very easy” for the company to find out who they were. 37% said it would be “somewhat easy” for the company to find who they were. 13% said it would be “not too easy” for the company to find who they were. Those who had not taken any steps to obscure their online activities were much more likely to say it would be “very easy” for a company to trace them (56% said so).